For those prefer to travel by car, once arrived at the highway exit, one should follow the directions to reach the by- pass of Naples and then continue in the direction toward Pozzuoli up to the junction Via Campana. Follow the signs to the port of Pozzuoli (departures Medmar Caremar), or (recommended) to the highway exit "seaport, or Naples port", if you have the reservation (recommended) you can access directly from the port gate Bausan completely avoiding the city traffic and follow the signs for Calata Porta di Massa (departures Medmar Caremar). Other access gate to the port of Naples is Varco Pisacane, reachable from Via Marina, with dedicated access and parking areas. For those who want to leave the car parked on secured parkings to embark by hidrofoils from Napoli Beverello or by ship from Calata Porta di Massa. The Port can be reached by Taxi, The departures of the buses to the port (Piazza Municipio, Piazza Castello, Marina) are served every 10 min., while the tram every 15 minutes. Line 1oftheMetrofromNaples Central Station to PiazzaGaribaldiandthesecond stop, toPiazzaMunicipio, is theclosesttoMoloBeverelloabout 5minutes by walk. Arriving by plane at Capodichino Airport, you can reach the Beverello (hydrofoil departures, Alilauro, Caremar and Snav, distance 16 km, time about 20 min. along the highway and Via Marina, 10 km, or about 27 min. through the center) or Mergellina (Alilauro and SNAV hydrofoil departures), by Taxi or bus. A shuttle bus(Alibus) connects the airport to Beverello, P.zza Municipio where a bus connects to Calata Porta di Massa, ship departures (Medmar Caremar). The shuttle bus leaves every 20 minutes. starting at 06:30 until 23:30. To know the updated timetable, routes and fares please see the website: Bus Times and Routes in Ischia. La partenza è prevista alle ore 9.00 da Piazza dell'Indipendenza a Roma all'angolo di via Solferino. Il raduno per l'imbarco è previsto alle 8.45. Prima di arrivare al porta di Napoli l'assistente di viaggio consegnerà le carte di imbarco per accedere direttamente agli aliscafi, evitando la fila alla biglietteria del Porto di Napoli. - From Rome to Ischia Porto: 9.00 (bus) 12.10 or 12.50 (Alilaurohydrofoil), arrival in Ischia 13:00 or 13:50; Returning from Ischia Porto at 16:40 (Alilauro hydrofoil) arriving at Beverello at 17:30, connecting flight to Rome (bus) at 17.40 and arriving in Rome at 20:00 (estimated). 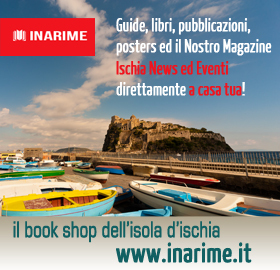 - From Rome to Ischia Forio: 9.00 (bus) 12:05 (Alilauro hydrofoil)), arrival in Ischia at 13.00, returning from Ischia Forio at 16.30 (Alilauro hydrofoil) arriving at Beverello at 17:30, connecting flight to Rome (bus ) at 17.40 and arriving in Rome at 20:00 (estimated). - From Rome to Capri: 9.00 (bus) 12.40 (hydrofoil FPM), arrival in Capri at 13.30, returning from Capri at 16.30 (hydrofoil Lmp) arriving at Beverello at 17.30, coincidence to Roma (bus) to 17:40 hours and arriving in Rome at 20:00 (estimated). You can reach Ischia thanks to craft Alilauro - Alicost operating a passenger service quickly and safely.